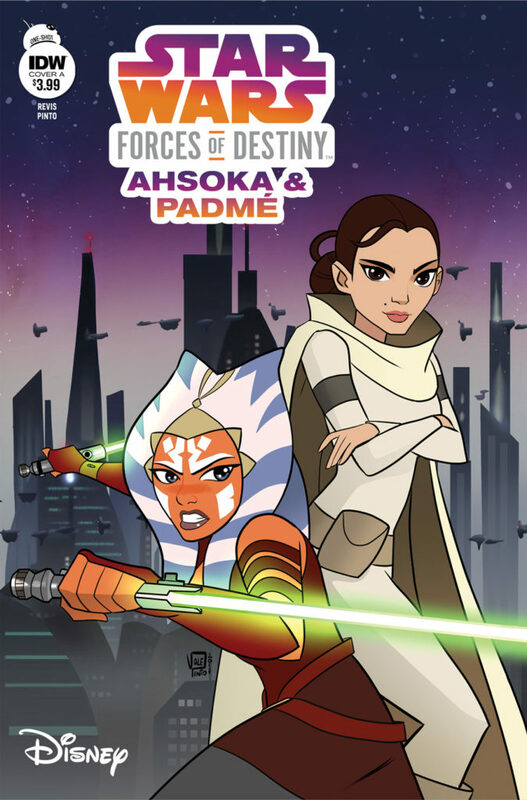 Star Wars: Forces of Destiny – Ahsoka & Padme is a nice adaptation of the episode “The Imposter Inside.” Rather than being a straight adaptation, this comic adds a lot before and after what takes place in the episode. The issue opens with a sparring session between Ahsoka and Barriss which pushes the idea that Ahsoka isn’t the typical Jedi. This concerns Ahsoka as she’s worried she isn’t a good enough Jedi. Padme stops by to ask for her help with preparing for a meeting with the Arthurian delegation. This leads into the Forces of Destiny episode, “The Imposter Inside.” However, it does a lot to flesh out the episode. It reveals what the Arthurians are like, what their peculiar customs are, and explains why they don’t use utensils when they eat. It also shows all the initial security prep work Ahsoka did for the meeting. The action events play out the same as the animated episode, but the story continues in the comic as Padme reflects on how similar Ahsoka is to Anakin, which leads to Ahsoka realizes that her differences from other Jedi can be a strength. It makes for a great adaptation as it takes an episode and adds a lot more to it. The art for the issue is very close to the style of the show. It’s pretty much an exact match, which makes the story very seamless. Overall, a good issue and definitely one worth checking out for fans of the show. I give it a five out of five nexus.